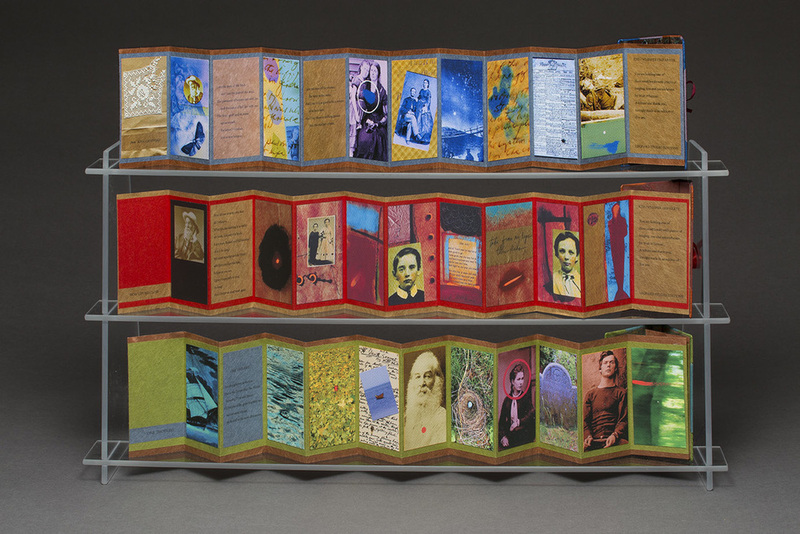 A set of three miniature books titled, THANKS, WALT, is a tribute and thank you to the passionate Walt Whitman. The poems are taken from among his last which speak with a voice of longing, loss and astonishment. Lovingly created using inkjet images drawn from the artist’s photographs, drawings, paintings and collection of antique tintypes, as well as archival photos. An edition of 5 sets of 3 books each; The miniature volumes are inspired by an antique style ledger and are trimmed in leather with a ribbon tie. The miniature form encourages a closer look, influenced by Whitman’s line, “Now hold me close”........ Each of the three volumes is stamped on the spine with a single word, KISS, WHISPER, SEPARATE to hint further at the content. Housed in a clamshell box, lined with shimmering marbled paper by Pamela Smith. A leather inset with the words, THANKS, WALT and W.W. blind stamped on the spine complete this little homage to the great American poet.